Former Syrian vice-president Abdul Halim Khaddam has thrust himself into back onto the political centre-stage after months of silent exile. From his new base in Paris, he accused Syria's President Assad of threatening murdered Lebanese ex-PM Rafik Hariri in the months before his death. His comments on al-Arabiya television caused a storm of protest from the Syrian parliament, where MPs unanimously demanded he be put on trial for treason. But the interview sparked speculation elsewhere that an undeclared battle for the future of Syria was under way. 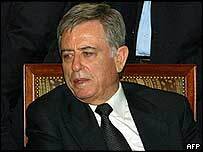 Until his resignation in June 2004, Mr Khaddam had exercised considerable influence in Syrian politics for three decades and had been regarded as a leading hardliner. Born in 1932, he was one of the longest-serving veterans in Damascus' Baathist regime. He was an official in the party by the 1960s, before being appointed foreign minister and deputy prime minister in the 1970s. In 1984 Mr Khaddam was promoted to the vice-presidency, and worked to assert Syria's dominance over Lebanon. He was seen as the architect of Syria's controversial policy of military presence and political dominance over Beirut. "Lebanon will either be united or will be returned to Syria," he said in 1976. He served for many years under the late President Hafez al-Assad, transferring allegiance to his son Bashar when he took office in 2000 after his father's death. While in power, Mr Khaddam remained fiercely opposed to any loosening of the Baath Party's grip on power. In a newspaper interview in 2004, he said that those who suggested changing the regime either did not understand that this would jeopardise the "stability of the state" or "serve the plans of foreign elements and of Israel". But in his comments to al-Arabiya, explaining his decision to resign, Mr Khaddam criticised the regime itself for failing to modernise and sought to portray himself as a reformist. He said he had quit because a series of major reforms, which would have boosted freedom and democracy, were not progressing. "I became convinced that the process of rehabilitation and reform, be it political, economic or administrative, will not kick off," he said. "So I decided to resign. I did some soul-searching and faced two options: to side either with the homeland or with the regime. "I chose to side with the homeland because it is the constant fact, whereas the regime is a transient state in the history of the country, just like other regimes elsewhere." Some observers see Mr Khaddam's extraordinary intervention from Paris as marking the start of a battle for the Syrian leadership. In the Syrian parliamentary debate which followed Mr Khaddam's television comments, one MP warned him: "If you dream of returning to Syria on a US tank, no citizen will accept that." And in Lebanon, an anti-Syrian MP told AFP news agency: "The battle of Damascus, the battle of the regime has begun."